Microsoft has offered the first look at its forthcoming Windows Store for apps, that'll be a central feature of the new Windows 8 operating system. At a preview event in San Francisco the Redwood-based company revealed that the app store will launch alongside the beta version of the new OS in late February. Boasting the now-familiar Metro-UI the store will be indexed by Bing to make it easy to find apps from within and also by using the web-based app store. The company says that the store will feature content from digital books from the likes of Disney, newspapers like The Telegraph, popular games like Cut The Rope and shopping portals like eBay. There'll also be seamless app integration between your Windows PC and Windows 8 tablet. Microsoft says it is setting up the Windows Store to enable popular developers to earn more from sales, depending on how many apps they sell. Like Apple, Microsoft will take a 30 per cent cut of all purchases until app app grosses $25,000. At that point Microsoft's share drops to just 20 per cent. The company also says its own app portal will be less rigid than Apple's App Store with free previews and in-app purchases available to developers, yet not enforced. "Some stores force you into a business model that's good for them, but we make it easy for you to innovate not only with your app but also with your business model," said Microsoft's Antoine Leblond. "To that end, Microsoft will make it easy for developers to build features like in-app purchasing into their apps but won't have rules for or against doing so." The company is hoping to woo developers by citing the 500 million Windows 7 licences sold around the world, pointing out the total is higher than iOS, OSX and Android. 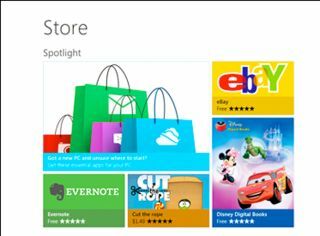 The initial apps to populate the Windows Store will be invitation only and free to download as Microsoft looks to bulk up the content ahead of the full Windows 8 launch in 2012. The company has also launched a Windows Store blog with a massively in-depth explanation of the store's every intimate detail.